CarGurus has 2,079 nationwide A7 listings starting at $13,991. The A7 may be the best of this boorish bunch—all claiming that a slight deviation in design means a whole new style has been born. It’s certainly starting with a fetching foundation, with the A6 providing a pleasing platform upon which to improvise. And this year the A7 gets some extras added to the already-attractive package: new head- and taillights, new front and rear facias, a slight change for the exhaust and some extra tech inside. The taillights were ditched due to financial considerations, as the old helix design was Audi’s costliest lighting display. Say hello to some new light bars as a replacement, along with new rectangular exhaust tips. Up front it’s thinner LEDs for the headlights, and a couple of air dams flank a re-sculpted grille opening, although the self-dimming Matrix lights are an option. Unfortunately, the round radar sensors up front remain and stand in strong visual contrast to the rest of the car’s design. Engines remain the same as well, and that means the A7 gives you the option of supercharged or turbodiesel performance. Each offers a unique power profile from a 3.0-liter V6, whether you’re looking for bone-wrenching torque or that supercharged surge. The TDI 3.0 gets you a modest 240 hp and a menacing 428 lb-ft of torque in a package that’ll still deliver 24 mpg city/38 highway, while the supercharged V6 offers 310 hp and 325 lb-ft of torque with a still-respectable 18/28 mpg. And both with get you to 60 mph in about 5.5 seconds, even while pushing all 4 wheels. Not bad at all. Audi will claim the A7 is a 5-passenger car, but anyone who’s spent any time in that back seat will tell you that the middle space is just that—a space, but not a seat. In fact, headroom is scarce enough out back that even in the actual seats they’ve had to carve out some extra crown space from the headliner, even with the deeply recessed cushions. But heated, 12-way power front seats mean you’ll easily find your perfect position, despite a driver’s seat not fully centered on the steering wheel. Leather is standard with your choice of trim, and ventilation can be added if heat concerns you more than cold. But keep in mind, at just 55 inches tall, the A7 is on the low side for the segment, so you may have trouble mounting and dismounting this steed. Once you get inside, you’ll be treated by nearly every tech goodie Audi has to offer. Audi MMI Touch augments the Multi-Media Interface with a scratch pad that will interpret your calligraphic entries better than your second-grade teacher could read your cursive. There’s also voice connect and 3D Google Maps with local search for real-time traffic, weather and news. Even in base kit, you’ll still get Audi Drive Select, 19-inch alloys, a rear-view camera, keyless entry, HD radio with iPod connection and a power sunroof. Move up to the Prestige trim, and you’ll add a Bose stereo, a power-adjustable steering column and 4-zone climate control. Does the A7 offer what you’re looking for in a “sport coupe”? With the rear seats down, there’s a lot of extra, albeit shallow, space to utilize, although I’m not sure there are a lot of A7s making the trip to the local DIY center. No, it’s style over space here, and buyers are flocking to the back more than the hatch. Instead, this is the perfect opportunity for some sexier styling if you prefer the curves of a coupe to the straight sedan, but still want some V6 power. Europe has the option of a 4-cylinder that may make its way to our shores eventually, so your options may increase soon. For now, this is proof to competitors like Porsche that while “4-door coupe” isn’t exactly logical, that doesn’t mean it has to be ugly, too. What's your take on the 2015 Audi A7? 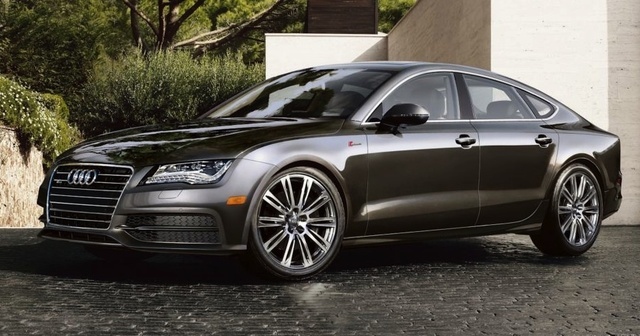 Have you driven a 2015 Audi A7?